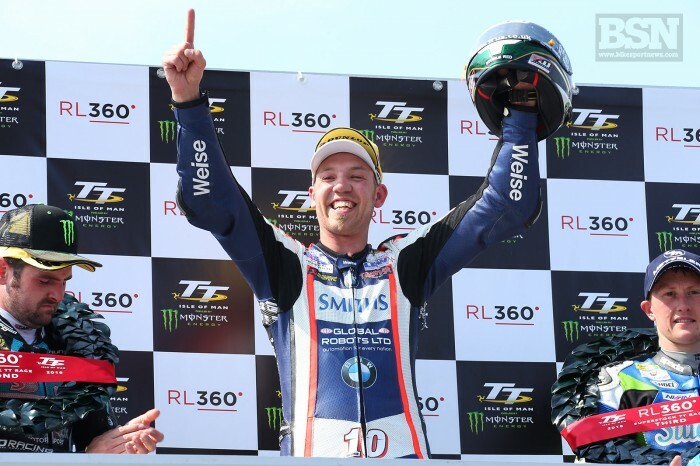 Peter Hickman claimed his first ever victory at the Isle of Man TT Races on Monday afternoon, when he admitted it was the hardest he’d ever ridden around the Mountain Course as he took a sensational win on the Smiths BMW S1000RR in the four-lap Superstock race. Second time around, he smashed the class lap record with a speed of 134.077mph but, despite of that, there was still only three seconds covering Hickman and main rivals Michael Dunlop and Dean Harrison, with his lead being only 1.2 seconds. The gaps continued to fluctuate and at Ramsey on the fourth and final lap, Peter only led Dunlop by 0.146s but with some record sector times over the Mountain, he edged away to eventually win by 4.4 seconds, with his final lap of 134.403mph setting a new Superstock lap record and only just outside the outright lap record set by Harrison on Saturday.